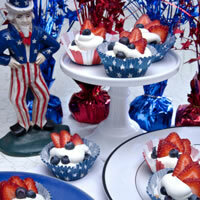 These red, white and blue treats will be a hit at your summer and July 4th festivities! Line 12 muffin cups with paper baking cups. Place about 2 teaspoons chow mein noodles into each. Melt chocolate according to package directions; spoon about 1 tablespoon into each cup to cover noodles. Refrigerate at least 1 hour to set. In mixer bowl, combine cream, sugar and vanilla; beat on medium speed of electric mixer until soft peaks form. Gently fold in blueberries. Spoon an equal amount of cream mixture into each cup. Top with strawberries; serve immediately.